Bill in Burl wrote: Since the cause of the vine breaks is part of the "hub" design breaking off (it's like a typewriter key with the design protruding), the break at leaf 7 went from a small break (1 bead or less) to a medium (more than 1 & less than 2) to a large break (2 or more beads). The brass cents that I've seen all have small vine breaks at 7 because they were from the first reverse dies made from the hub. The improper mixing in the pots of the bronze alloy happened early in the planchet making process (I'm sure that the entire metal sheet that the planchets were cut/punched from was not all the same alloy .. just portions of it as the ingots were rolled into the sheets. If your coin has 2 or more bead-width at the #7 vine break, then it would have been from a later-made working die and, logically from later planchet bunches. That's not to say that there weren't some "brass" planchets that were struck with later dies .. it's just that it isn't really logical that they were. Again, someone get me some photos of your coin and I'll look at it and/or tell you how to get it to an very honest guy with access to an XRF machine. 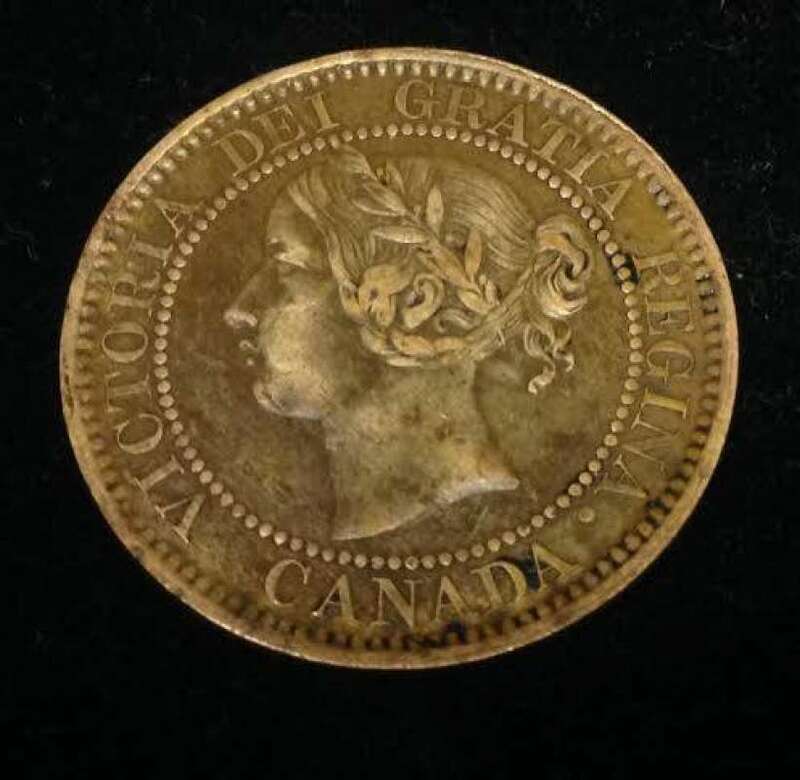 I had him XRF over 600 1859's when we wrote the articles on the brass '59's in the Canadian Numismatic Journal. 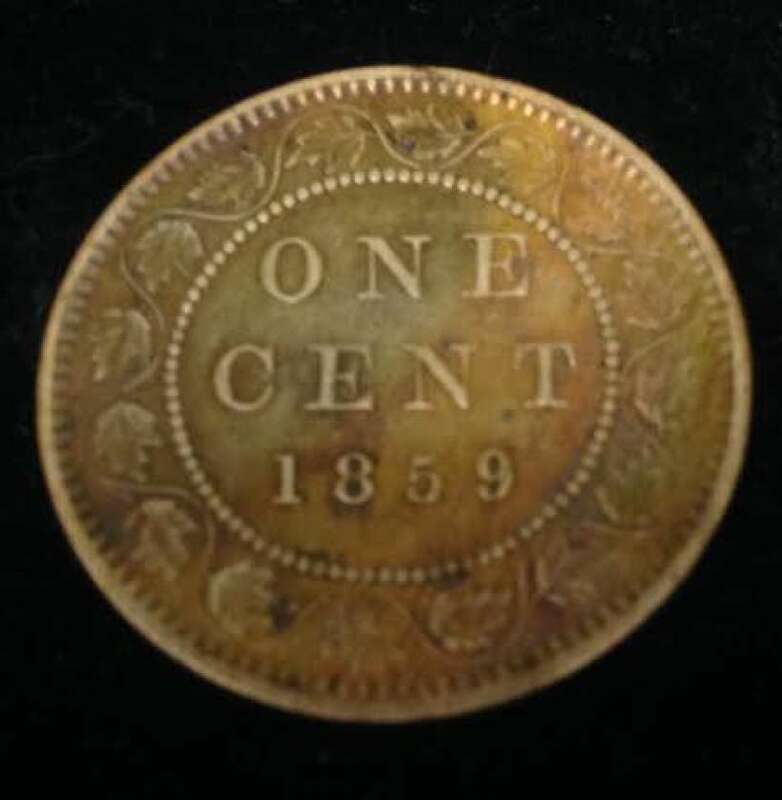 I looked at your profile on facebook and couldn't find a picture of the coin in question...I had also sent you a message through facebook my nick name there is "Redrivercoins"
My personal opinion is that it is not brass, but rather thoroughly cleaned with an oxidizing agent some time in the past. To me, the color is not right, and looks like hundreds of others I have seen with similar color that were just cleaned bronze. Also, this is a very late struck coin, judging by the vine breaks at 7 and 2. There is still a possibility that it is one, but I doubt it. Can he send it to Ottawa for XRF? Bill in Burl wrote: My personal opinion is that it is not brass, but rather thoroughly cleaned with an oxidizing agent some time in the past. To me, the color is not right, and looks like hundreds of others I have seen with similar color that were just cleaned bronze. Also, this is a very late struck coin, judging by the vine breaks at 7 and 2. There is still a possibility that it is one, but I doubt it. Can he send it to Ottawa for XRF? I sent more pictures to shilo ....the reverse in the picture isn't very clear and the break on my coin isn't more than two beads. if you want to call me. my understanding says copper becomes brass after addition of 4-5% zinc? I have a problem thinking it was cleaned but knowing the break is supposed to be 2 beads or less makes me believe im in the ballpark. I believe the only way to remove all doubt is xrf what does this analysis do....does it say what the entire content exists of? is it a pistol? my #5302993264 thank you. An XRF in completely non-destructive and can be done through the mylar of a 2X2 with absolutely no damge to the coin. It will give you a chemical analysis of the alloy. There really is very little difference between bronze and any of the nearly 50 different kinds of brass. Most bronze is 95Cu, 4 Sn & 1Zn and that was what was required for the 1858-59 planchets. Drop the copper down to 92 and raise the zinc a little and you will have some type of an alloy that a few chemists would call brass. None of the more than 700 1859's that we tested came close to that, including nearly 50 that were very similar in color to yours ... but they were just the result of cleaning with a chemical agent some time in the past. Your coin definitely has been cleaned in the past. On a normal "uncleaned" 1859 in your grade or slightly better, you would have dirt/gunk in every nook and cranny. Yours is completely clean except for some foreign localized dark material on the Obverse. That stuff came either after the cleaning or was something that the cleaning didn't remove. If someone has the expertise to copy the 6 page article (Mar 2012) and send it to 'kwever' I'm sure that he would appreciate it. It was written by 3 pretty well-recognized experts. Again, every certified brass 1859 that I have seen has a vine break at 7 that is a bead or less wide..... yours is much more and also has a break at leaf 2. Anything even approaching 2 beads or more is late in the striking cycle.